If you want to know about LGBT rights in Cuba, you could ask someone who survived Castro’s infamous UMAP work camps, like poet Reinaldo Arenas, except you can’t. Granted, the author of Before Night Falls deliberately chose death with dignity while succumbing to the AIDS virus, but the hard labor surely did not do his health any long-term favors. Currently, the Castro regime has put on a happy face for LGBT tourists, but Jesus’s father has not gotten the memo. Hairdressing is one thing, but the long absent father will not stand for his son’s drag performance aspirations in Paddy Breathnach’s Viva, Ireland’s shortlisted but not very Gaelic official foreign language Oscar submission, which screens during the 2016 Sundance Film Festival. It used to just be Jesus and his mother, but now it is just him. His father, Angel the boxer, took a powder years ago. The details are sketchy, but apparently prison was a factor. Jesus’s world now revolves around the old ladies in the neighborhood whose hair he cuts and the performers in Mama’s drag club, whom he coifs. He also sometime hangs with his slutty platonic pal Cecilia, but he grows weary of her self-centered behavior. When a performer bails on Mama, he (awkward pronoun) gives Jesus a shot under the stage name Viva. The kid shows promise, until one day Angel interrupts his routine with a knuckle sandwich. It seems the old man is back, tipped off by the churlish Cecilia. Obviously, drag is out. However, Medina has to do something to feed himself and his lay about father, so he starts hustling near the international hotels. There’s your Cuban tourism in action. Still, do you suppose the father and son might come to accept each other as they grow to know each other better? Does Castro’s thugs beat up the Women in White? Of course they do. 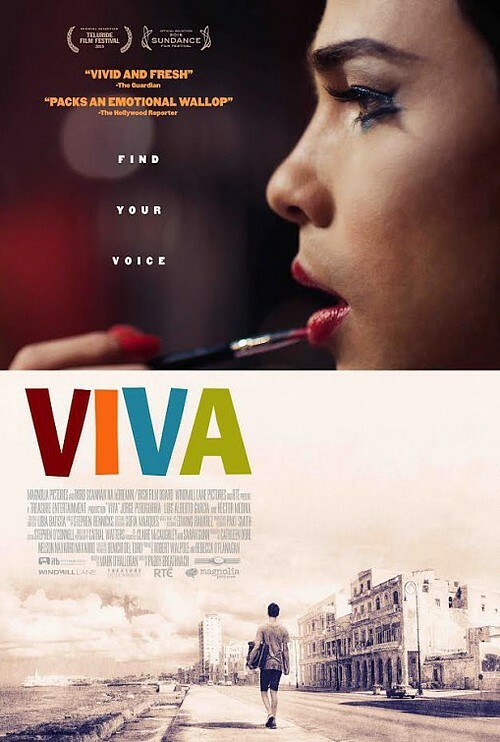 Viva could have been a pretty hard-hitting expose of Cuba’s two-faced LGBT policies, but Breathnach and screenwriter Mark O’Halloran opt to keep it strictly personal on every level. However, that narrow scope becomes a saving grace, forcing them to rein in potential melodramatic excesses. Things never get too cringey or messy, frankly because folks like Jesus and Angel cannot afford such indulgences (or surnames). It might be a small film, but Breathnach takes plenty of wide shots, trying to sop up as much of Havana’s crumbling Old World elegance as possible. It is indeed highly cinematic, but it also looks like the entire city is on the verge of collapse. Although Stephen Rennicks score is not exactly legit Afro Cuban, Rumba, Son, Danzon, or Pachanga, it has enough Cuban flavoring to be pleasant and peppy. Héctor Medina is quite compelling as Jesus, in a severely dour and self-contained way, which contrasts quite effectively with his stage demeanor when adopting his Viva persona. Jorge Perugorría is solid, but never really surprising as Angel. However, it is Luis Alberto García who really throws it down as Mama. So, honor thy father, but to thine own self be true—or something like that. Viva is not about to stretch beyond Polonius for take-aways, but it is reasonably nice on its own terms. It features some terrific work from the Cuban cast, but its lack of bite is ultimately disappointing. Recommended for those who can appreciate elements of La Cage aux Folles and Creed married together, Viva screens today (1/23) at noon in the Sundance Resort and Monday (1/25) in Park City, as part of this year’s Sundance Film Festival.